This season's new thread is starting a lot later than usual. Not only the Bisons, but the whole CW, are off to a slow start on new announcements. Well, that changes a bit because the schedule came out today. So I open with a 2-parter. This post has the links, which will be updated as the season draws closer, and the next one brings us up-to-date with announcements. There has not been as much off-season news released thus far in 2018-19 as is normal. But today we got the new schedule, and the Bisons also have their exhibition games on their page. The men's season starts a week earlier than the women's because on the weekend of October 5-6 the annual deluge of games against NCAA teams will take place. The passes for CanadaWest.tv will go on sale June 21st. The Bisons open on the road in the Town of Bedrock against the Dinosaurs on September 28-29. The home opener follows October 12-13 against the Evil Monkeys, dubbed "Pandas" by the folks running the website. There are two "conference byes" early on. The October 5-6 weekend is to accommodate NCAA exhibition games. The Herd will be off to the Ralph to face the UND No-Longer-Fighting Sioux on Saturday, October 6th. That game is not on the Bison schedule, but is on the UND schedule. The second conference bye is November 2-3. One thing I don't like is that the Bisons have road series on either side of the second bye week, meaning 4 weeks between home games. I expect an announcement of a game against the Edinburgh Capitals to be played August 23rd. Upon returning to North America, the Bisons will play in Regina on September 14-15 and then Regina will visit here on September 21-22. The Regina trip is presently listed as games against Regina, however they usually face two different teams in a tournament format. The story on former Bison coach Barry Trotz winning the Stanley Cup adds a level of conjecture. Maybe for old times sake he'll do some work with the Bisons until the NHL firing season begins. Wouldn't that be something? UMFM will have all Bison hockey men's and women's home games on their 2nd stream, if not on the 1st stream and 101.5 itself. And they will also be the audio for CanadaWest.TV broadcasts. We can now renew subscriptions, by the way. Starting this season, the UMFM broadcasts will be simulcast over the Canada West TV broadcasts! There will be some modifications, but all the graphic overlays and information present on Canada West TV will also be discussed on the radio broadcast. In its most basic of explanations, Canada West TV and UMFM will have the exact same broadcast going out over the respective mediums. This way, listeners on both mediums will get the knowledgeable information and reporting that UMFM provides on the radio broadcasts that was previously unavailable on the Canada West TV broadcasts. As you probably know, UMFM does a lot of work in getting stories about the players last season to ensure high-quality broadcasts, and the feedback received by Bisons Sports suggested that this was missing on the Canada West TV broadcasts. Although not confirmed on the team webpage, Elite Prospects has sourced out confirmation of three Junior A acquisitions. The Bisons were short-staffed on the blue line last year so any announcement of a new defenceman makes me happy. Here we have 6'4", 220 lbs of solid southern Manitoba country boy. He was a 2nd team MJHL all-star. I'll take it. His dad played for the Bisons under coach Barry Trotz. Now here's a player who has been around. When he came out of midget he had one game in the Dub with Lethbridge and then played for 5 different teams in the MJHL. Midway through the 2017 season he landed in Nipawin, where he finished his junior career as assistant captain and with a provincial title. He is much better known for toughness than finesse. His best offensive season in juniors was 5 goals, and he had 215 pims last year. The links have two unique stories. First, the Hawks were scheduled to play the Humboldt Broncos the night of the fateful crash. Also, his brother Jack played for Steinbach (MJHL champs) and they faced each other in the Anavet Cup. 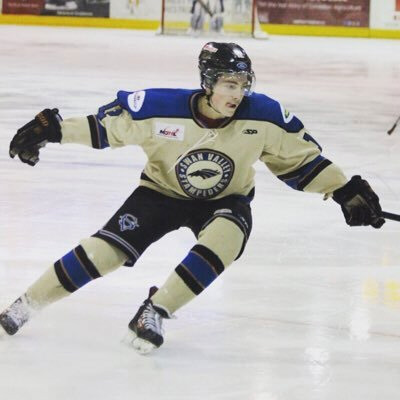 Meanwhile, Channing Bresciani, a graduated defenceman from last year's squad, has been signed by CBR Brave of the Australian Ice Hockey League. Goaltender Matt Hewitt from UBC is also on the squad. The seasons are opposite down under so they are well underway in a new season. In 10 games Bresciani has 2 goals and 16 assists. Last edited by Hollywood; 06-27-2018 at 01:03 AM. It's usually the recruits from the WHL who create off-season interest. Thus far, nothing much in that regard around the CW, and just one rumour around Manitoba. The rumours of a new blue-chip goaltender prospect have been around since reported at [CUSN] at the end of March. The Bisons have had the same set of 3 goaltenders for 3 years now. I'm not sure if Byron Spriggs is returning. If so, great. If not, a new recruit is a must. Brown is a Winnipeg boy who pursued a major junior career in Regina before a mid-season deal sent him to Saskatown. So I have a photo in each jersey. Last year, Brown was 19-17, .889 S%, 3.44 GAA, and the Blades missed the playoffs. In past seasons his playoff numbers were better, i.e. .915 save percentage. The other potential goaltenders are Justin Paulic and Dasan Sydora. At one time Paulic and Spriggs both spent stretches as starter. However, last year Paulic seldom dressed. Sydora is a reasonable #3. I look forward to seeing the roster page in August. Last edited by Hollywood; 06-27-2018 at 01:08 AM. Not sure what this is about, but it involves Matt Alfaro of the Calgary Dinos. June 26: FROM THE U.K. The Belfast Giants have a press release for their series against the Bisons. The online release also has video highlights of the 2nd game from a year ago. One team the Bisons will not be facing is the Edinburgh Capitals. Their EIHL team folded, although they will continue to operate a team in the SNL, a lower league. Their site has a linked story from the EIHL press release. The Capitals were in last place a year ago and were last in 4 of the last 5 years, and 2nd from last the other. Another local team (Murrayfield Racers) also acquired the lease on their arena. The Racers applied for but were denied membership in the EIHL. Must be a lot of behind the scenes stuff going on there. As a result, there exists room for another game for the Bisons. There are two other Scottish teams in the EIHL, the Dundee Stars and the Fife Flyers. The Flyers have been around a long time and returned to the UK big leagues the same year the Jets returned to the NHL. Last edited by Hollywood; 06-27-2018 at 01:13 AM. Another defenceman! Good. One year the Bisons finished first when forced to dress 7 to 9 d-men almost every game due to injuries. The reverse would have been impossible. And Dwyer has some credentials. He bounced between the MJHL and WHL, so he'll have some scholarship money to cash in. He's a Winnipeg boy returning home, as is fairly common. At 6'3' and 194 lbs he will have the size the Bisons need. He also wore an "A" for Portage. In his last two seasons in Portage he was getting close to point-per-game as well. Last edited by Hollywood; 06-27-2018 at 01:14 AM. I know that the argument for payments will rage on, but IMO the conference has tried making TV coverage better and steps are being made. Hopefully, there will be more free on-line radio coverage available. Sometimes that's all I want when watching HNIC, or another game on CWTV. The USports site has a rarity - an actual story is posted! 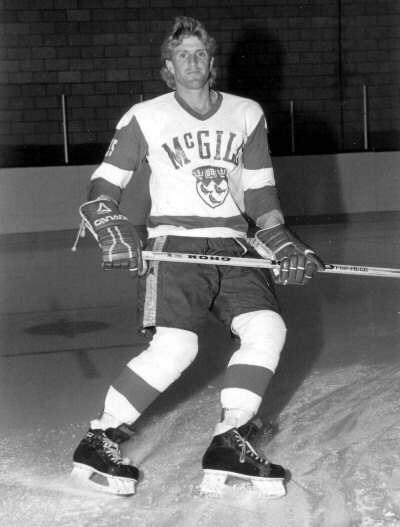 A pretty good one on Mike Babcock, former defenceman for McGill. Head coach Bill McDonald has retired. He has coached several Thunder Bay teams, including the Thunder Bay Twins (in 1986) and the Thunder Bay Thunder Hawks and Senators of the Colonial and United Leagues. He has been with Lakehead since 2013. His replacement is assistant coach Andrew Wilkins. Lots of his coaching past was in Manitoba-based competitions back in the day. They seem dedicated to ensuring annual games against their northern Ontario brethren from Nipissing and Laurentian. Everybody else had their schedule announcements when the hockey schedule came out. Lethbridge did an all-sport announcement. I see that an all-sport pass is $100. By comparison, Manitoba's is just $60, or $90 to include football. I better get the all-access CWTV pass, just to avoid accusations of being a tight-wad. There is a discrepancy about the scheduling of the season-opening series between UBC and Lethbridge. The CW and Lethbridge schedules both say the games are Sept 28-29. However the UBC schedule says the games will be Oct 5-6. Since Oct 5-6 is a "conference bye" to accommodate NCAA play, it would make sense for the teams to push back their opening if they are not participating in such games. So this is something to look for in future updates. The Bisons have another decent forward on the way. Devon Skoleski split last season (his overage season) between P.A. 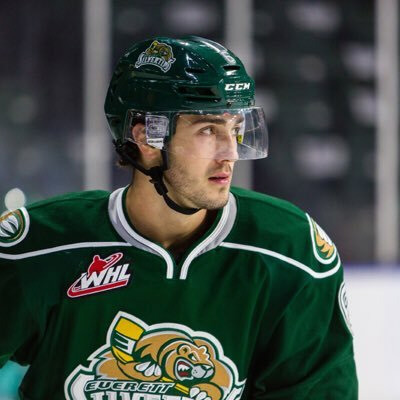 and the Blues, after having spent two seasons with the Everett Silvertips of the WHL. He is a smaller (5'11" 161 lbs) winger from St. Adolphe, Manitoba. In the WHL he had 70 points in 169 games, but in 17 MJHL games he was 12-13-25. I stumbled upon notice of this signing via Twitter. Jameson was the Swan Valley captain last year. He is 6', 190 lbs. and is a Brandon native. I can’t say enough good things about him – he’s a special young man. He’s very driven and was committed to this program. On the numbers front, Jameson's numbers through three MJHL seasons have been trending upwards. He's gone from 7 points in 2016, to 44 points in 2017, and then 70 points (22 G 48 A) in 59 games in 2018. In their upcoming tour of the U.K., the Bisons will play twice against the Belfast Giants. Ironically, two new recruits for the Giants this season are graduated Banjo Mutts: Kendall McFaull and Josh Roach. Both played their full five seasons for the Mangy Ones. McFaull (defenceman) is 26 years old and in 2010 was drafted in the sixth round by the Atlanta Thrashers. Roach (forward) is 25 years old and last year was a CW all-star. In 27 games he had 13 goals and 24 assists. 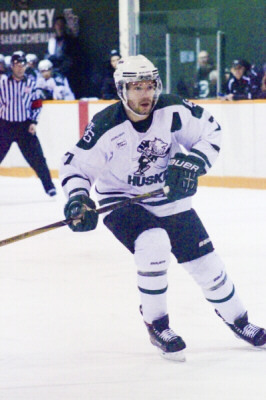 He previously played three seasons for the Humboldt Broncos (from 2009-10 through 2011-12). Returning to coach the Giants is former Manitoba Moose Adam Keefe. He was kind of a useless player but found his niche in Belfast. He was a popular player over there and so they kept him on as a coach. The links include a couple of news stories, plus Giants' pages at various web sites. So those can be checked periodically for updates as the series draws closer. Kendall McFaull - Putting away his banjo in order to move to Belfast. Josh Roach - Also giving up the moonshine of Saskatown. The fancy digs in Belfast sure are a step up from The Rutherdump! Last edited by Hollywood; 07-03-2018 at 08:15 PM. As we have now celebrated our country's birthday, summer feels like it is in full swing. And with a large batch of recruiting announcements (albeit from unofficial sources) coming last week, it is worthwhile to look at how the roster is shaping up for 2018-19. As I always say, you never know how good of a recruiting class you have until you know who is returning. It is unusual for a team to have the same three goaltenders for three seasons in a row. But that's what happened to the Bisons last year. The news of Brown being recruited was good news, just to ensure that new blood was coming if nothing else. So who's leaving? Spriggs finished his 4th year and was the starter. However, he was not listed as a graduate at the senior game (see link and photo). Paulic and Sydora are coming off their 3rd seasons. At one time, Paulic was challenging Spriggs for #1 but seldom dressed last year. Sydora is well acquainted with the role of a #3 goaltender. So this is a wait-and-see scenario. The team had some good performances on the blueline, but the shortage of numbers was a problem. Rene Hunter vanished after the pre-season, Sharonov never dressed for a regular season game, and Douglas was a mid-season recruit. As a result, captain Stovin had to shift from the forwards to the defence for several games. If even one of the three newcomers pans out, they should be improved this year. 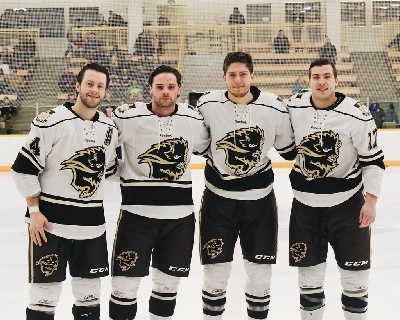 The Bisons had lots of forwards last year. The players they are losing were 8th, 16th, and 17th in team scoring. The new recruits look to be at least on-par with the graduates. Also, last year Wasylak was injured in the pre-season and never dressed for a regular season game. His return would therefore be like getting a new recruit. The wild-card is always the extent of improvement of Junior A graduates. They face a steeper learning curve than Major Junior grads. Last year Nault wound up as a key player on a great first line (with St. Croix and Franko), yet two years ago he was a frequent healthy scratch. Maybe the Bowles brothers are candidates to play that role this year. The key could be the second line. Last year Stovin kept switching from defence to forward, Laurencelle missed half the games, and Zajac never settled in with stable line-mates. Those three could be the best second line in the CW. All three have been at or close to a point-per-game in past seasons. After a glimpse of the Belfast Giants, I should also take a look at the Braehead Clan. The Bisons will start their tour against the Scots, based in Glasgow, on August 22nd. 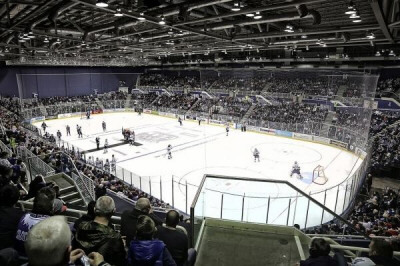 They play at the Braehead Arena, which holds 4,000 for hockey and is reminiscent of a WHL arena. It seems to be part of a nicely designed entertainment zone, as illustrated in the photos. The building also hosts Disney on Ice, concerts, and the like. EIHL teams have a fair amount of turnover, and import lots of players. Right now, the team has 15 players signed, and announcements of new signings should keep apace until the game is held. Unlike Belfast, I don't yet see anybody with a CIS/USports connection. The various links will have new stories as the season approaches, and the team seems to have pretty good local coverage. 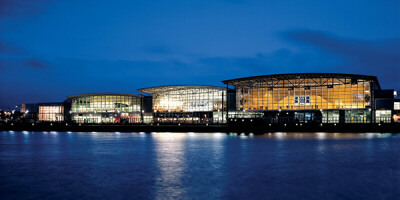 The Braehead Arena and vicinity at night. An interior view of the Braehead Arena. The purple uniforms are clearly a very colourful look. Last edited by Hollywood; 07-03-2018 at 12:48 AM. No sooner did I post about the Braehead Clan, and now they no longer exist! They have been transformed into the Glasgow Clan. The logo is slightly different, but the bold purple colours remain. Victor Findlay has a new Tuesday Morning Skate, after taking a week off. A nice round-up of everything happening in USports hockey. Read it! Of note, the Brock Badgers have 12 recruits. That's as much as I can remember any team having. 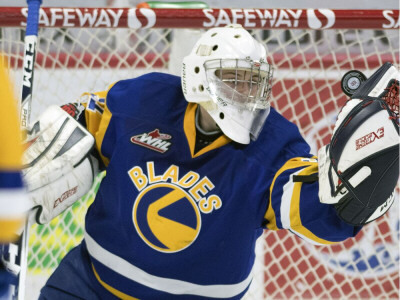 - UBC also got a goaltender, Patrick Dea (WHL). Former Evil Monkey Derek Ryan has signed a contract with the Calgary Flames, a 3-year deal worth $9.4 million. It never hurts to see a CIS/USports grad get a big contract. Last edited by Hollywood; 07-03-2018 at 09:30 PM. Before I get going here, I can point out that the links in the OP have been updated for 2018-19. Some of those are blank, or have a lot of zeros, but at least the links are now current and ready to roll. The Elite Prospects site is revamped and is nice to work at. I have links to their USports page, and the USports Transactions page as well. The latter has the most up-to-date recruiting announcements. The news from the CW is that the Calgary Dinos have signed Brad Schoonbaert from the Steinbach Pistons. 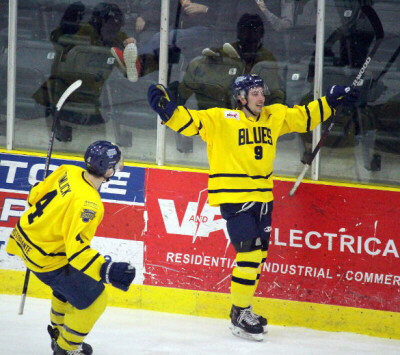 He was the #2 scorer in the MJHL a year ago. The rumours of the demise of the Eastern Washingtion Eagles from the BCIHL were first spread at the International Hockey Forums. However, the press release eluded me, and EWU continued to be on the BCIHL website, and kept making recruiting announcements. Well, I now found the story. EWU used to have their first team in the BCIHL and a second club team in the ACHA. Now they will just be in the ACHA. This leaves the BCIHL with just five teams, with hopes of adding more. There are many candidates. Thompson Rivers, Fraser Valley, and Northern B.C. used to be in the league. There are also a lot of colleges in the PacWest (CCAA) who could be in the market as well. 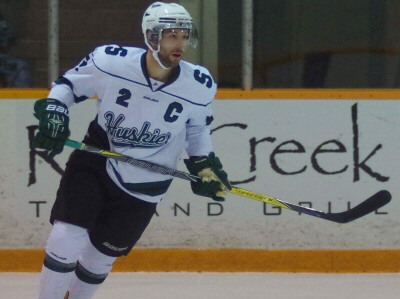 Shaq Merasty, former Manitoba Bison and Portage Terrier, has signed a deal with the Rapid City Rush of the ECHL. He has tremendous potential. Hopefully, he will get his game to fit together. The Bluegars have no news, but Victor Findlay's Twitter says d-man Tyson Helgesen (Spokane - WHL) will play for MRU this year. They had a disappointing recruiting class last year (especially in comparison to their cross-town rivals), so this would rank as a very positive story for them. The link on the Banjo Mutts tells us about Roach and McFaull heading to Belfast, as previously reported in this thread. The new news is that goaltender Jordon Cooke is headed to Gap, in France. No doubt they will sport trendy and tasteful uniforms. Once upon a time, Alberta and UBC played for the Hamber Trophy, even before UBC joined the former WCIAU. Well, the Evil Monkeys have one pre-season series noted in their schedule now, and that's a trip to British California to face the T-irds! In recent years UBC have prepared for the season without facing any CW teams. The T-irds have made it official - They have a commitment from goaltender Patrick Dea. He played for the Tri-City Americans of the WHL, after having played several seasons for the Edmonton Oil Kings. In 47 games he was 22-14-0, 3.17 GAA, and .913 S%. Will he be a good replacement for Matt Hewitt? Last year, Hewitt was 12-5-1, 2.85 GAA, .920 S%. That was well above the performance of his back-up, the returning Rylan Toth, who was 2-7-0, 3.79 GAA, .882 S%. Time will tell. Sep 07 Alberta at U.B.C. Sep 08 Alberta at U.B.C. Manitoba and Alberta are thus far the only CW teams with exhibitions on their team schedules. And Alberta just added their UBC weekend. 1. Regina always hosts multiple teams, in a quasi-tournament format. Since Regina and Manitoba play the following weekend in Manitoba, they usually don't face each other in Regina. My suspicion is that two or three other teams will join in on Sept 14-15 and the likely candidates are Saskatchewan, Calgary, and Lethbridge. 2. The weekend after Regina generally features the Brick Invitational in Edmonton. Accordingly I look for Alberta, Mount Royal, Calgary and at least one other CW or ACAC team to be there on Sept 21-22. 3. The ACAC schedule was my source of information for the match-up between MacEwan and Calgary. MacEwan has won the ACAC the last two seasons, and are members of the CW in other sports. They usually don't participate in interlocking games with the CW, however. This is a positive development IMO. 4. Alberta's CW teams will likely be adding a fair number of games against ACAC teams. In recent years Alberta has started the season early against UA-Augustana, and Lethbridge has faced Red Deer. NAIT and SAIT are frequently opponents as well. Since Mount Royal left the ACAC for the CW they have avoided (or been avoided by) ACAC teams. It's about time for that to change. 5. UBC has hosted Ontario teams the last two years, but this year it is Alberta headed to the left coast. My guess is that UBC will follow with games against BCIHL teams again. 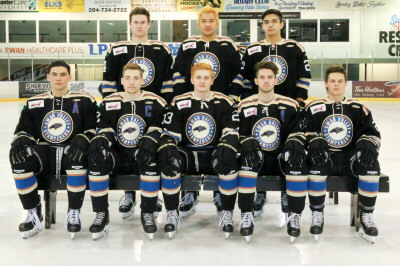 I hope they play Trinity Western because they are CW members in other sports and won the BCIHL title last year. They could also be at the Brick Invitational. 6. A southern Alberta team usually heads down for a Colorado triple-header weekend against Air Force, Colorado College, and Denver. The early sources for such games are usually the NCAA links (see below). I see that Colorado College is off to Alaska that weekend, however. Denver does not play until Nov 2nd, and Air Force's schedule is on 2017-18. 7. Mount Royal is not likely traveling to Minnesota for just one game, so I suspect at least one more game to be added there. Otherwise, it looks like a light year for NCAA games. 8. I suspect that lots of teams will not play at all Sept 7-8, but everybody will play on Sept 14-15 and Sept 21-22. After the Braehead Clan became the Glasgow Clan, they have been active with YouTube clips. I have the links! July 10: U.B.C. RECRUITS ANOTHER FROM THE W.H.L. 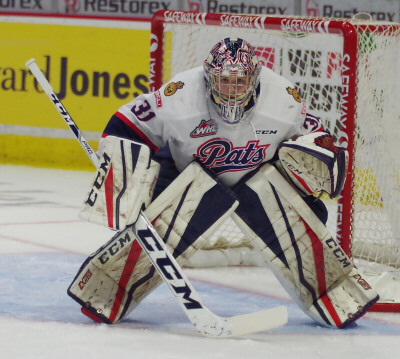 The T-irds announced a commitment from Maxwell James, from the Tri-City Americans of the WHL. He's a big winger with low scoring numbers. However, this is a team perennially short of size and toughness. If he shores up those problems, he'll be a welcome addition. Also, the UBC schedule is now consistent with Lethbridge's and the league's, in that their opening series is shown as Sept 28-29 instead of Oct 5-6. The MJHL website has a linked story on their connections to the Bison recruiting class. No new names were disclosed. Coach Mike Sirant is quoted as claiming that 60% of the roster once played in the MJHL. Seems correct, albeit many of those also played WHL. The story goes over past Bisons as well, and points out that Kevin Saurette, a one time CW all-star, is now the MJHL's Director of Operations. [Keaton] Jameson joined several Bisons for weekly on-ice sessions last week and is excited for the upcoming season. “I think it’s going to be a good change of pace for me. I’m looking forward to it,” he added. Bisons training camp will take place early this year (begins Aug. 13) because the team will be heading to Europe Aug. 19 to play exhibition games against professional teams in the British Elite League. The Bisons will return on Aug. 29 and will play in exhibition games mid-September before getting their regular season underway late September. Bison Zach Franko was on the CUSN's radio show "Breakin News 'n Crackin Brews". Amongst the topics was an update to the UK tour. Instead of facing the Glasgow Clan, they will instead face the Manchester Storm and Fife Flyers. And Franko will not be making the trip because he is taking summer courses. I dug up some links (see below). The game in Manchester will be on August 21st. Manchester had a team called the "Storm" from 1995 to 2003, and then a team called the "Phoenix" from 2003 to 2017. Their teams were back and forth between Britain's top and 2nd tier leagues as those changed over time. 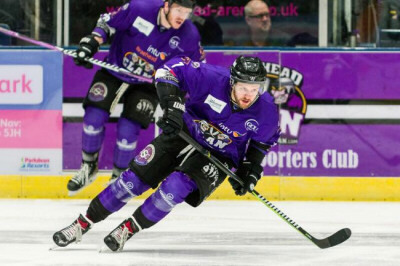 The Storm were back in the EIHL in 2015-16 and improved each year so that they were 35-16-5 last year. The Fife Flyers will host the Bisons on August 23rd as part of their 80th anniversary festivities. They have operated since 1938 and are Britain's oldest hockey team. The returned to the top tier EIHL the same year as the Winnipeg Jets returned to the NHL, 2011. The team has steadily been on the rise, going from last in 2011 to mid-table in 2017-18. The T-irds landed two big names, both forwards. Steven Hodges last played for San Antonio and Portland in th AHL and Cincinatti and Manchester in the ECHL. He was a 3rd round draft pick for the Florida Panthers. He has not played since 2015-16, and had three 20+ goal seasons in the WHL with the Victoria Royals. Colton Kehler comes from the Edmonton Oil Kings of the WHL. He's coming off a 30+ goal season in the WHL, after two seasons of 17 and 18. Sep 14 Moncton at U.P.E.I. Sep 22 Dalhousie at U.P.E.I. Sep 26 McGill at U.Q.T.R. With the schedule changes on the Bison UK Tour, I posted a few links last week. Now it's time to give some more background on the newly announced Bison opponents, starting with the Fife Flyers. As mentioned, they are celebrating 80 years of operation this year and are the UK's oldest franchise. They also returned to the upper echelons of UK hockey in 2011, the same season as the Winnipeg Jets returned to the NHL. Also, two former Jets, Doug Smail and Laurie Boschman, also played for the Flyers. In almost 2 seasons (1993-94 and 1994-95) Smail had 82 goals and 89 assists in 56 games before being dealt to Cardiff. Meanwhile, Boschman played just 7 games in 1994-95 and scored 9 goals and 9 assists. In those seasons, the Flyers were in the BHL, a forerunner league to the new and improved EIHL. You might think Smail dominated the league. But he was second on his team in scoring, and 8th in the league. British legend Tony Hand won the scoring title with 72 goals and 150 assists in 44 games. On the Flyers, Mark Morrison had 78 goals and 77 assists. (He played 10 games over two seasons with the Rangers.) Current EIHL stats numbers are no longer so gawdy. The scoring leader last year had 83 points in 56 games. This is also their arena's 80th season. It is used for all hockey, curling, and ice skating in the area. I saw pictures of the ice and it has curling houses painted onto it. There are some interesting vintage photos out there. 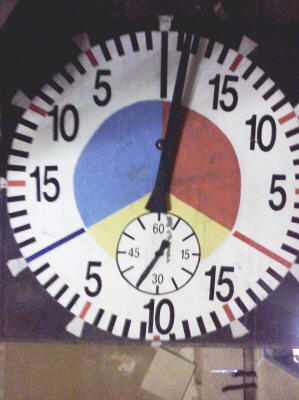 One I liked is the one of their old clock (below). Anybody remember the old Chicago Stadium? British hockey is a hodge-podge of different competitions. Although the Flyers were mid-pack a year ago (7th of 12 teams, 33-21-2 record), they did win the "Gardiner Conference", in which the Scottish teams played. They also consider the "champion" to be the best team over the regular season. The Flyers came on in the less-prestigious playoffs and finished 4th in the final tournament where they end with something like the Frozen Four or Memorial Cup. I also found some video highlights of past games between the Manchester Storm and Fife Flyers. The Bisons will start their exhibition schedule in the home of more top-notch bands than any city in the world. When you think of Manchester you think of the Buzzcocks, Joy Division/New Order, The Smiths, Oasis, and The Stone Roses. And if that isn't enough there's always James, Inspiral Carpets, Happy Mondays, and The Charlatans. I could post a video link for a classic Manchester tune every day until the game! There are/were a lot of USports/CIS grads on the Storm roster. Shane Bakker (C) and Matt Stanisz (D) were with Carleton (Bakker from 2008-09 to 2012-13 and Stanisz from 2011-12 to 2014-15). Felix-Antoine Poulin (D) was with St. Thomas from 2011-12 through 2014-15. Linden Springer (D) was with Lakehead in 2015-16 and 2016-17. 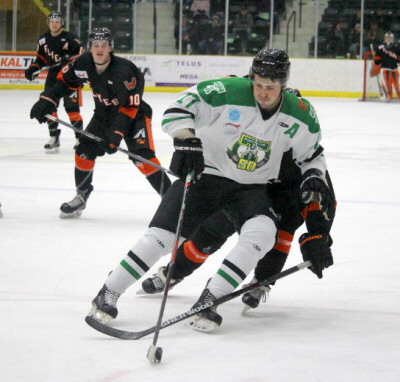 Former Bison Taylor Dickin also played for the Storm in 2016-17, but split last year between the Dundee Stars (EIHL) and Birmingham Bulls (SPHL). 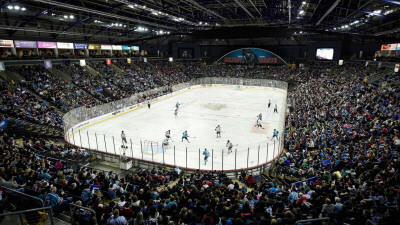 Hockey in Manchester has been up and down, going back and forth between Britain's first and second tier leagues, and rotating between the Storm and Phoenix franchises. At one time, they drew a crowd of over 17,000 to a game, then had to fold a couple years later. Seems expense management is the problem. 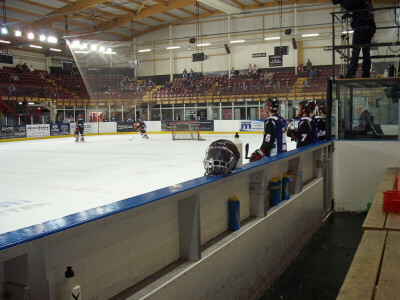 They now play in a small rink of 2,400 capacity, called the Altrincham Ice Dome. 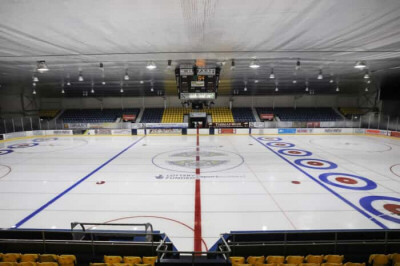 Altrincham Ice Dome - current home holds 2,400. 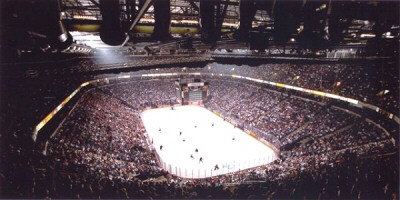 Manchester Arena - over 17,000 fans at this game. CUSN had another Tuesday Morning Skate this week. It goes over the recruiting announcements previously reported. In other news, Ian McNulty has finally escaped Regina and is off to the Tulsa Oilers of the ECHL. All times are GMT -2.5. The time now is 07:53 AM.